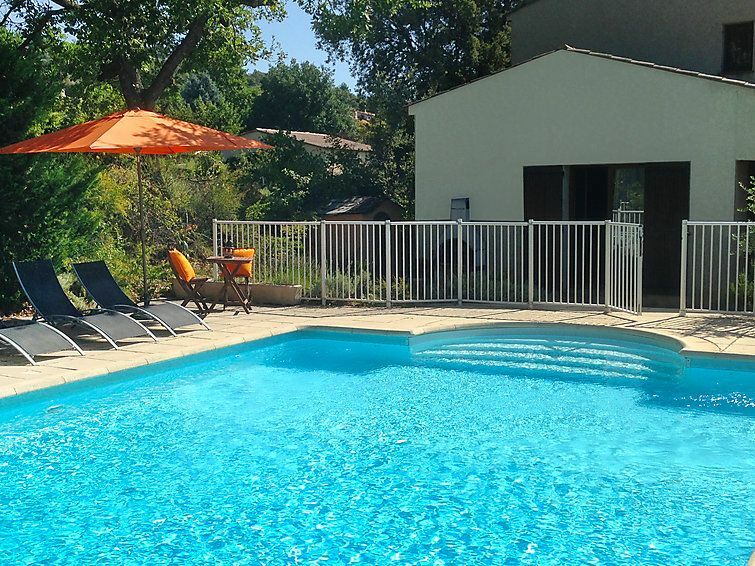 Vinon sur Verdon: Modern, comfortable villa "this property", built in 1987. On the outskirts Vinon sur Verdon, in a quiet position in the residential district, 50 km from the sea, 50 km from the beach, in the countryside. Private: garden 200 m2 with lawn and wildlife garden, swimming pool fenced (12 x 6 m, depth 111 - 230 cm, 01.06.-30.09.). Heating to be paid on the spot. Shop, supermarket, restaurant 400 m, sandy beach 50 km, bathing lake 50 km. Golf course 16 km, tennis, riding stable 400 m, walking paths from the house 200 m. Nearby attractions: Les Gorges du verdon. Well-known lakes can easily be reached: Sainte Croix 40 km, Esperon 50 km. Please note: car recommended. 4-room house 200 m2. Comfortable furnishings: large living room with open-hearth fireplace, TV, video and radio. Exit to the terrace. Gallery with 1 double sofabed. 2 rooms, each room with 1 french bed. Exit to the terrace. 1 room with 2 beds (90 cm). Kitchen (4 hot plates, oven, dishwasher, microwave). Bath/WC, shower/WC. Terrace roofed. Terrace furniture, barbecue. Facilities: washing machine, telephone, children's high chair, baby cot. Garage. Please note: telephone for incoming calls only. TV only EN.